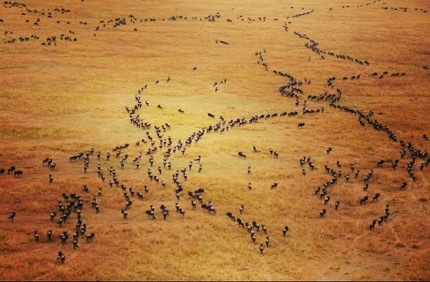 Each year, in the most extensive movement of animals known in the planet, more than 1.5 million wildebeest travel the plains of the Tanzanian Serengueti to the North of Kenya. Accompanied by zebras and gazelles, these herbivores gallop northward in search of the great pastures. Whales, crabs, fireflies, lobsters, birds, butterflies, and other 10 thousand species of animals, cyclically move in search of benign climates favorable to reproduction, in which they find food and, above all, survival. Very similar to human movements. According to the UN, by 2050 70% of the population will live in urban areas. Perhaps because of this, and because many are becoming increasingly sedentary, it is magical to see wild animals traveling great distances in a herd. However, it seems as if the magic we find in wild animals does not exist in human movements. By 2015, the number of people trying to be safe in Europe was so high that only the displacement caused by World War II surpassed it. In 2015, the number of forced displacements exceeded 60 million people for the first time in the history of humankind. Poverty, lack of employment, wars, climate change, and massive human rights violations are the causes of forced migration—which people primarily from developed countries have to brave, along with a high degree of indifference and violent rejection: attacks to migration centers, hard legislation, the strengthening of fascist movements with promises of elimination of all difference beginning with the racial, and the building of border walls, more than 70 in the world similar to “Tortilla Curtain”, which separates the United States and Mexico. As usual, gestures of love emerge in the midst of the crisis, for there are those who understand movement as an essential part of nature. They remember that hunters and gatherers were populating the planet over millions of years before becoming sedentary. They also recognize that today, more than 40 million people are still nomads and, above all, nomadic or sedentary, as Fredy Chicangana says, “we travel like mother earth songs, whispers coming from distant forests, elusive words that seek to be a drop in the human heart,” and, like the wildebeest of the infinite plains, we throw ourselves into life impelled by the beauty that we sense strongly, despite the walls and the predators. That is why they protect the path, because they know that for both animals and humans, migration has become a journey full of dangers. Juanita Rojas is a Historian with a Masters in Development and International Cooperation. She is Colombian and has lived in Guatemala for five years. She has been working in development projects for more than 7 years with migrants, women, families and young people.